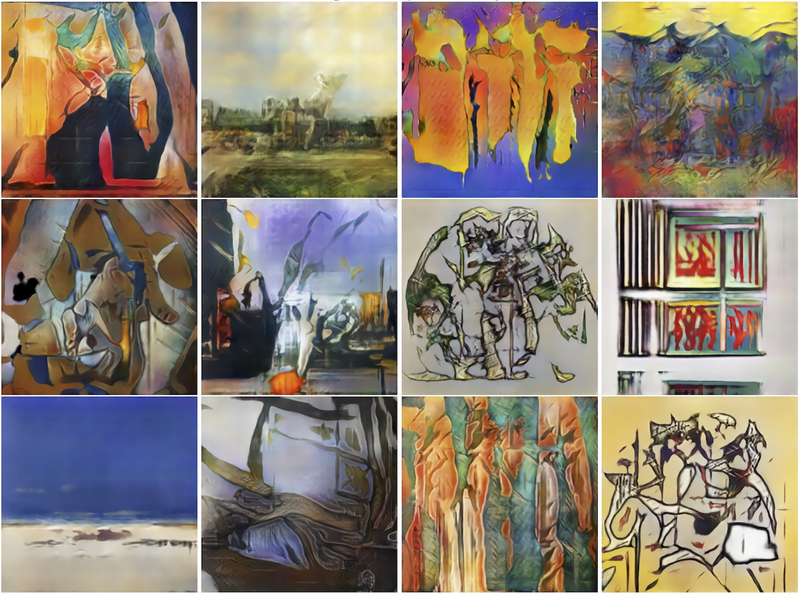 A computer program called (CAN) Creative Adversarial Network has been making creative works that are being compared with art made by human artists, and it is learning how to continue to improve it's works by itself judging them and having people judge them. This is important because if a computer can truly make art on its own then it can make artists obsolete. One of the doubts about the program being truly creative is if people were just voting the works to be good because they could be sold. While I disagree with this idea I understand the thought that they could just be viewing the art as something marketable. The pieces to me who is is just a normal person with no qualifications whatsoever are very visually pleasing to look at and I personally like the computer generated images. "Researchers then tested whether or not these generated works could pass as creative to some people. An object, for their purposes, demonstrates creativity if it is both “novel and influential.” When compared to human artists works it was judged to be lesser than the code generated art, whether or not it is lesser it is undeniable that the code generated art is very impressive. 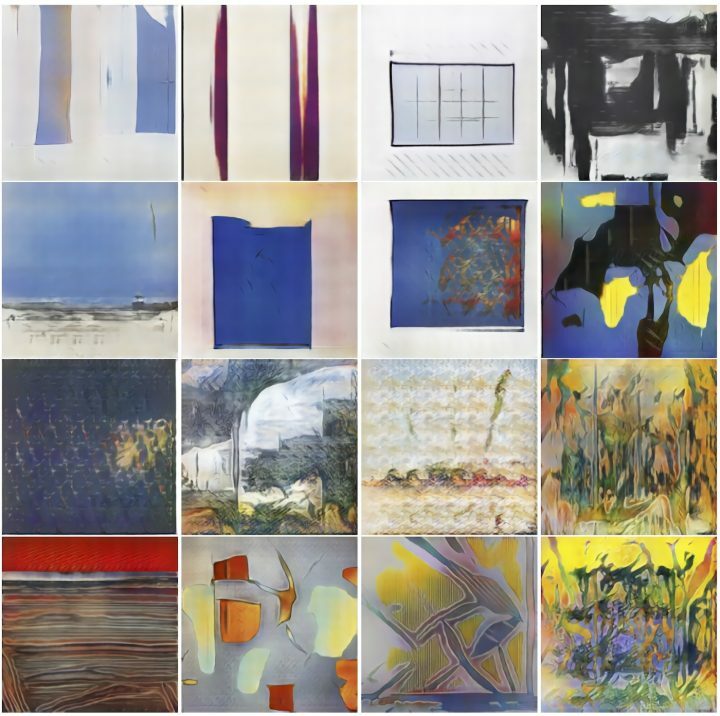 The Creative Adversarial Network was created by a team of computer scientist researchers at Rutgers University in their Art and Artificial Intelligence Laboratory "Computer scientists at Rutgers University developed a system to generate artworks that were deemed more communicative and inspiring than human-made art" (Hyperallergic) The results of their research on machine learning created the results of these paintings that ended up being more visually pleasing to viewers than man made ones were. Voon, Claire. “Humans Prefer Computer-Generated Paintings to Those at Art Basel.” Hyperallergic, Hyperallergic, 31 July 2017, hyperallergic.com/391059/humans-prefer-computer-generated-paintings-to-those-at-art-basel/. Interesting topic you've chosen. Images could be a bit larger. Interesting topic, but the article could be improved by adding further details about CAN (who made the program? When? Why exactly, with direct quotes? etc.) with proper citations. Also, the layout of the images could be edited further - the size differences are noticeable, and both are too small to make out the details in each of CAN's pieces. I found this to be a really interesting article. I really appreciated that you expressed your viewpoint on whether or not artist will become obsolete as computer programs continue to produce creative images. One improvement I would suggest is working on the formatting of the images in relations to the texts a bit more. Maybe for your final revision you can align a single image so that it aligns to just a single paragraph on texts.